Missouri Fox Trotting Horses can be found competing in various competitions all over the world. The Missouri Fox Trotting Horse Breed Association (MFTHBA) is committed to supporting local shows and the inclusion of Missouri Fox Trotting Horse classes. To support this commitment, the MFTHBA has recently announced a new program designed to recognize Missouri Fox Trotting Horses and MFTHBA members competing in local horse shows. The newly launched MFTHBA Horse Show Buckle Series allows show managers to establish their own competition series designed around the needs of their competitors. • Horses competing for the High Point Buckle must be registered Missouri Fox Trotting Horses. 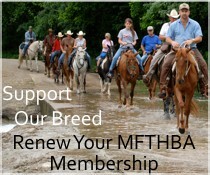 • The owner and exhibitor of the horse must be current MFTHBA members. This membership must be current before any points accrued may be counted toward the high point award. • Series must contain at least 3 shows. At least 1/3 of the participating shows must utilize a MFTHBA carded judge. • All other requirements for the individual buckle series will be determined by the individuals requesting the buckle series. Shows may be sponsored by any organization. To set up a local MFTHBA Buckle series, the participating shows must submit a proposal for their series utilizing the series application form. All information must be completed and the form must be signed by each participating show manager. Once completed, the proposal, along with a $50 application fee for the series, should be submitted to the MFTHBA office. Once the series is approved, the application fee will be deposited. Within 30 days of the completion of the series, the series manager is responsible for submitting series results to the MFTHBA office and for documenting the series’ compliance with the MFTHBA’s requirements. In addition, an article highlighting the series winner must be submitted for inclusion in The Journal. Once this is complete, a special custom buckle will be ordered and mailed directly to the winner.